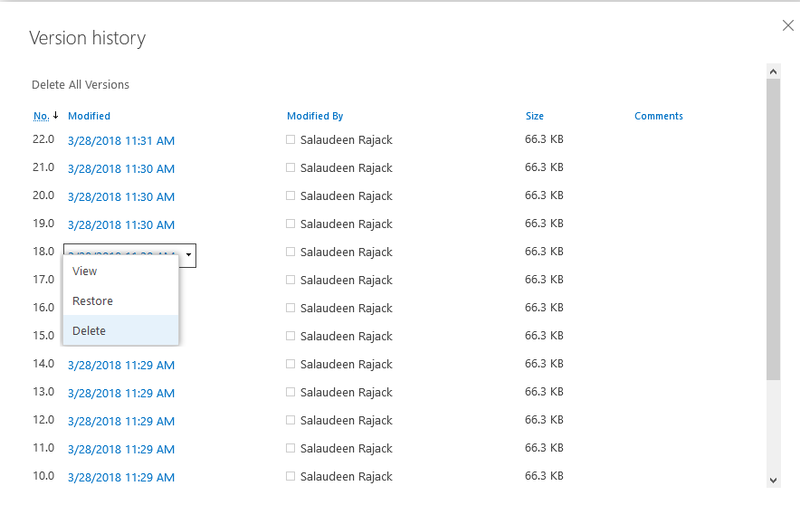 Requirement: Delete version history in SharePoint Online. How to Delete versions in SharePoint Online? On the version history page, You can choose "Delete" from the context menu of the particular version. To delete all versions of a document or list item, in the Version history page, click the "Delete All Versions" link, and then confirm the prompt. Lets delete all versions of all items in a list or library using PowerShell. $ListItems = Get-PnPListItem -List $ListName -Query "<View Scope='RecursiveAll'><Query><Where><Eq><FieldRef Name='FSObjType'/><Value Type='Integer'>0</Value></Eq></Where></Query></View>"
Going through version history page and deleting one by one is cumbersome. Here is the PnP PowerShell to keep last 'N' versions and delete all others. This script leaves the recent 'N' number of versions and delete all previous versions of the documents.